Alain Chirwisa of the Democratic Republic of Congo, better known as Alesh, is proof that the beat goes on. In October 2012, Alesh joined 31 other young musicians from around the world for the inaugural season of OneBeat. 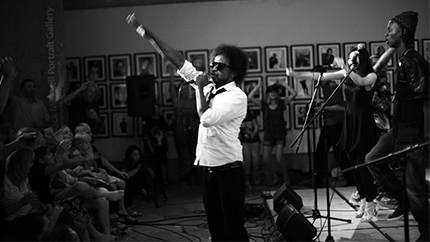 OneBeat is an incubator for music-based social entrepreneurship. Innovative musicians from around the world launch collaborative projects designed to make a positive impact on local and global communities. Now in its third year, OneBeat is cultivating a groundbreaking international network of sonic change-makers, cross-pollinating leading artistic, technological, and social innovation in music. During Alesh’s month-long residency and tour program, socially-conscious musicians collaborated and engaged with local audiences while fostering professional networks, and illustrating democratic values inherent in improvisational and collaborative music-making. Alesh’s current album, GET LOUD, was sponsored by the U.S. Embassy Kinshasa. GET LOUD is the first album ever produced in the DRC that is entirely focused on women's issues! It features 11 tracks by 21 Congolese artists from five different cities in the Congo (Lubumbashi, Kinshasa, Kisangani, Goma and Bukavu) and one Japanese artist. Alesh was recently selected from more than 49,000 applicants throughout Africa to represent the DRC as a Mandela Washington Fellow, part of the President’s Young African Leaders Initiative (YALI) in New Orleans, Louisiana and Washington D.C. From July 28-30, Alesh attended the first U.S.-AFRICA Presidential Summit in Washington, D.C. Since participating in the OneBeat program, Alesh has been working on his upcoming album, AFRICAN (R)EVOLUTION, which will be released in the coming months. When he was not working on his new album, he toured the DRC and the United Kingdom. He is also the founder and artistic director of "Mental Engagé Asbl" (Committed Minds Association), a non-profit cultural association focused on producing, disseminating, and promoting socially-committed artistic initiatives, organizing awareness-raising programs, and using urban culture, more specifically hip hop, as a means of communication. Alesh continues to draw inspiration from his OneBeat experience as he remains active in his community and strengthens the Lumumba Cultural Center in Kisangani, which promotes freedom of expression, youth leadership, and music entrepreneurship.